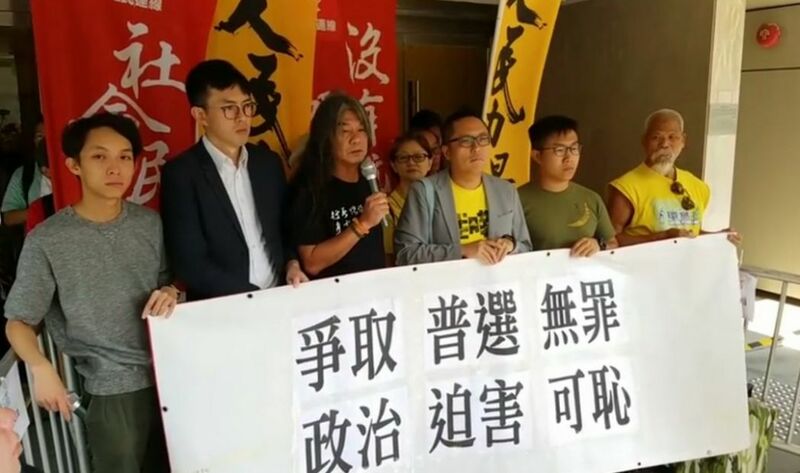 Former lawmaker “Long Hair” Leung Kwok-hung and Tam Tak-chi “Fast Beat” of People Power have said they planned to appeal their conviction over a 2015 protest against then-chief secretary Carrie Lam. The High Court denied Leung and Tam’s appeal of their conviction on Tuesday. However, the court reduced the duo’s sentence from a seven-day jail term to a fine of HK$3,000. Leung Kwok-hung (third from left) on Tuesday. Photo: Facebook screenshot. On May 15 2015, Leung and Tam staged a protest at a secondary school debate tournament held in Queen Elizabeth Stadium, which Lam attended as the guest of honour. 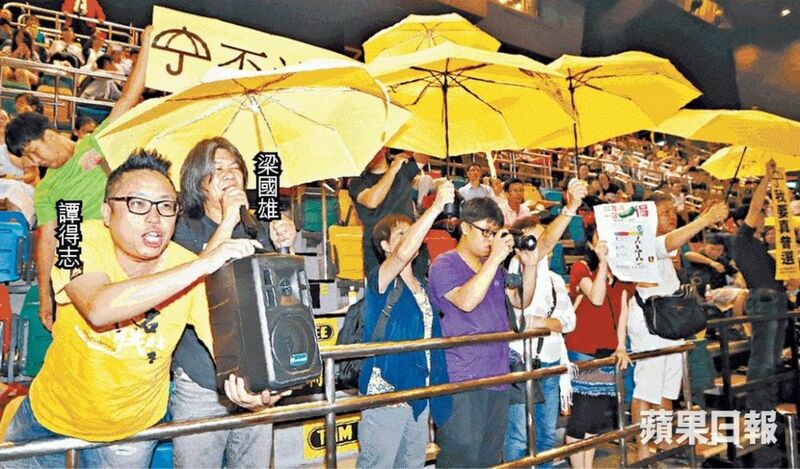 The duo, along with a group of protesters, shouted slogans using a loudspeaker and held up yellow umbrellas to show their opposition to Beijing’s 2014 decision on the chief executive election process. The event organiser, Sing Tao News Corporation, reported the incident to the police and the duo was convicted in 2016 of “wilfully obstructing, disturbing, interrupting or annoying any other person in the lawful use of a civic centre,” under the Civic Centres Regulation. Both Leung and Tam were sentenced to one week in jail, but Leung was released on bail pending appeal. Tam’s sentence was suspended for one year. Leung and Tam at the 2015 Sing Tao Debate Competition. Photo: Apple Daily. Chan added that he accepted Leung’s argument that no violence was used. 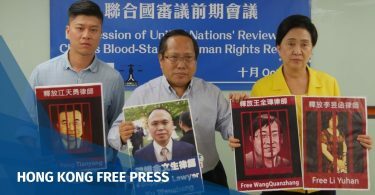 “[Leung] only used the loudspeaker to shout slogans from beginning to end, and did not use force or even violence to express his views, and did not cause any injury or property damage. Therefore the protest was peaceful from start to finish,” he wrote. After the ruling, Leung and Tam criticised the government’s method of prosecution and said they will appeal to the top court. Leung expressed concern that the use of the Civic Centres Regulation would deter future protests at Leisure and Cultural Services Department venues. 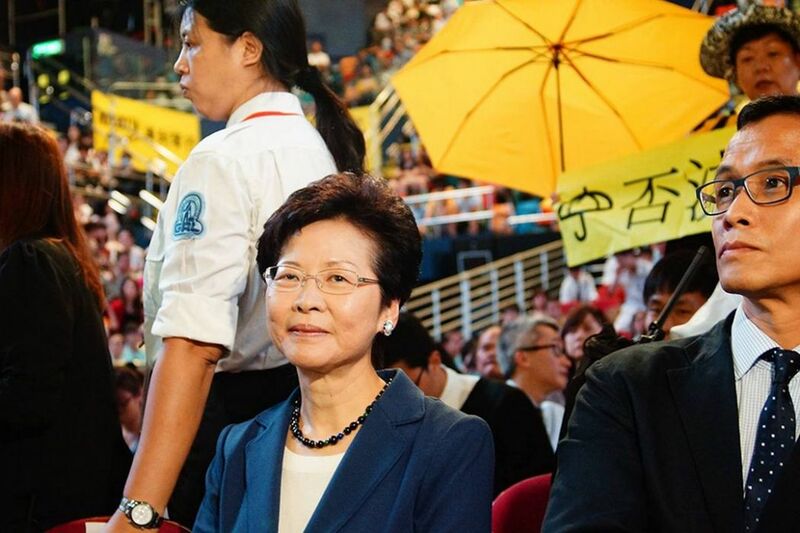 Then-chief secretary Carrie Lam attending the 2015 Sing Tao debate competition. Photo: Cloud. Leung also accused magistrate Joseph To Ho-shing, who decided the case in its first-instance hearing, of being biased. “[To] said he wanted to personally rule on my case, and told my lawyers this a day before the hearing… this shows our system is failing: why would someone want to choose a specific case?” he said. However, the appeal judge rejected the criticism as a ground of appeal, saying it had no direct relevance to the case. The court will hold a hearing to decide whether to allow their appeal to proceed next week.